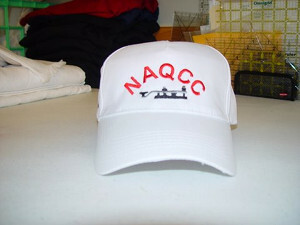 SHOW YOUR PRIDE IN BEING A NAQCC MEMBER WITH A CLUB SHIRT & HAT! Astrid's Embroidery & Quilts operated by Todd (WM8C NAQCC #4515) and Astrid (N8YZI) Strait are making available these beautiful shirts & customized hats to NAQCC members at very reasonable prices in today's market. The pictures show only a small sampling of the various styles and color combinations available. The shirts are available in black, white, khaki, navy, ice gray, light blue, royal, and cardinal red. The shirt logo is available in large (shown) or small size. Ignore the "model", but don't the shirt and hat look great! 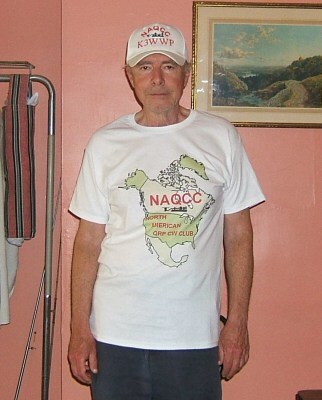 Imagine the attention you'll draw when you wear YOUR NAQCC shirt and NAQCC hat to a hamfest, a club meeting, Field Day....anywhere you come in contact with other hams or potential hams. 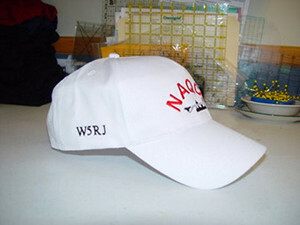 So come on and ORDER YOURS TODAY - show your pride in being a member of the world's largest QRP/CW club. The hats are available in 2 main styles, similar colors as the shirts, and a variety of call sign and logo placement. The pictures below show only a small sample of the very many possible combinations. 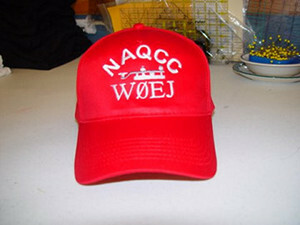 Wearing a NAQCC shirt and/or hat shows the ham radio world your interest in keeping CW alive and well on the ham bands. They also serve to publicize the club and attract new members to the club to make our pro-CW voice even stronger. ORDER YOURS TODAY and join those who have already ordered and are now proudly wearing their hats! 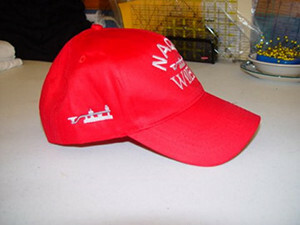 Visit http://www.astridsembroidery.com/naqcc-hat.html to place your on-line order now. If you have any questions about the ordering process, they will be glad to quickly answer you via email or telephone. See contact info.